(Photo: REUTERS / Utpal Baruah)India's Prime Minister Narendra Modi (C) gestures as he arrives to address the Bharatiya Janata Party (BJP) workers meeting in Guwahati, the main city in the northeast state of Assam, November 30, 2014. 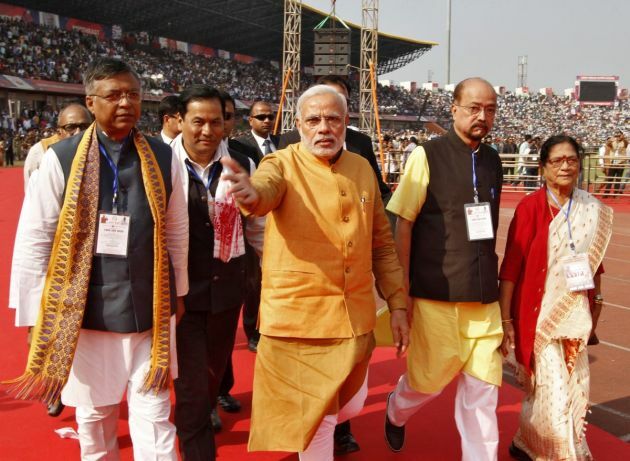 Modi stepped up his rhetoric against illegal immigration from Bangladesh, vowing to halt the unauthorized flow of citizens from the neighboring country into the northeastern state of Assam. Despite chastising a minister for her polarizing remarks, India's nationalist leader Narendra Modi has ignored calls to fire her for recently uttered derogatory comments against religious minorities. Opposition lawmakers have sought Niranjan Jyoti's dismissal from the government after she posed a choice at a campaign rally on December 1 - whether people wanted a government run by "the children of (Hindu god) Ram or the children of bastards." Jyoti, the minister of state for food processing industries, has since apologized for the remarks. The opposition perceived her words to be a slight against religious minorities in the Hindu majority nation, the Hindustan Times reported. In a statement, Prime Minister Modi acknowledged Jyoti's apology for her comments, asking lawmakers to continue their work in the upper chamber of parliament. "I was informed about the statement which caused the controversy on the day BJP parliamentary party was to meet. In the meeting I strongly disapproved of the remarks and I said we should avoid using such language," he said. "This minister is new, she has entered parliament for the first time (at the last election)... She has apologized," Modi continued. "I request the House to continue with its work in the interests of the country." The prime minister even tried to plead with the lawmakers in the upper house, appearing during the session as opposition members stalled the proceedings in the assembly. But members of the opposition kept pressing for Jyoti's resignation. A member of the ruling Bharatiya Janata Party (BJP), Jyoti issued the comments at a campaign rally in New Delhi where local polls will be conducted early next year. She went to parliament the following day to apologize, but lawmakers wanted her sacking for the irresponsible remarks. Hindus account for about 80 percent of the country's 1.2-billion population followed by Muslims with 13.4 percent, according to statistics. The remainder come from other religions such as Christianity, Buddhism and Sikhism, among other faiths.